Hungarian anatomist and pathologist; born at Budapest Dec., 1812; died in Paris July 5, 1881; educated at Vienna and Budapest (M.D. 1836). He then settled in Paris to study microscopy. His researches in the embryology of the higher mammalia attracted the attention of the Parisian Society of Physicians, which, in 1845, requested him to prepare anatomical specimens. In 1846 he began to lecture on microscopic anatomy at the Collège de France. In the same year he was made a knight of the Legion of Honor. After 1862 he lectured before the Medical Clinic of Paris on diseases of the vocal organs. 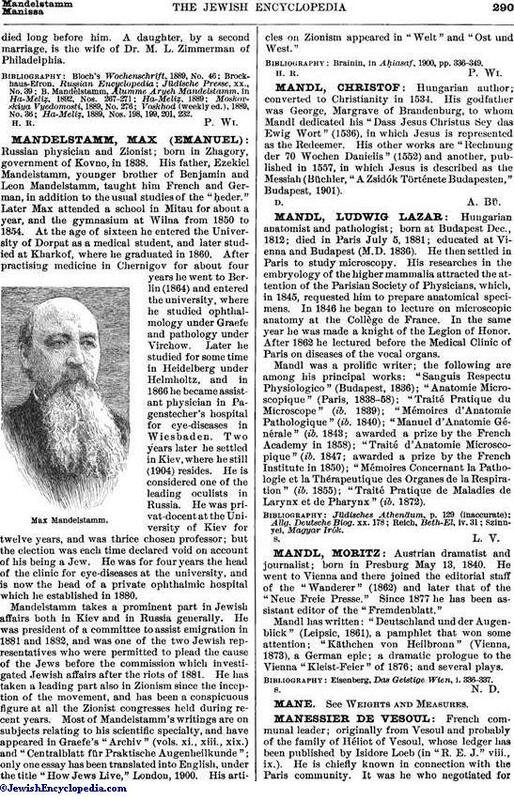 Mandl was a prolific writer; the following are among his principal works: "Sanguis Respectu Physiologico" (Budapest, 1836); "Anatomie Microscopique" (Paris, 1838-58). "Traité Pratique du Microscope" (ib. 1839); "Mémoires d'Anatomie Pathologique" (ib. 1840); "Manuel d'Anatomie Générale" (ib. 1843; awarded a prize by the French Academy in 1858); " Traité d'Anatomie Microscopique" (ib. 1847; awarded a prize by the French Institute in 1850); "Mémoires Concernant la Pathologie et la Thérapeutique des Organes de la Respiration" (ib. 1855); "Traité Pratique de Maladies de Larynx et de Pharynx" (ib. 1872).